Pleasant if mild memories of a short-lived (one-and-a-half seasons) sitcom called CPO Sharkey (1976-78) are confirmed four decades later with Time Life's release of The Complete Season 1. Don Rickles, Mr. Warmth himself, stars as the title character, a career Navy man saddled with a company of misfit seaman recruits at a San Diego naval base. Aaron Ruben, frequent director of The Andy Griffith Show, was returning to a genre he knew well, having directed eleven episodes of Sgt. Bilko and later co-created the long-running Andy Griffith Show spinoff, Gomer Pyle, U.S.M.C.. CPO Sharkey is a lot better than Gomer Pyle though not nearly as good as Sgt. Bilko. Nonetheless, Sharkey was reasonably funny and a not-bad vehicle for iconic, acid-tongued comedian Rickles, himself a real-life seaman first class aboard the USS Cyrene during World War II. Time Life's DVD set makes apologies for its best-available video transfers, but the shot-on-tape-before-a-live-studio-audience series certainly looks no worse than when it first aired. Further, the set includes as an extra what was then a headline-grabbing bit of showbiz lore: Johnny Carson crashing the CPO Sharkey set in the middle of a Tonight Show taping. 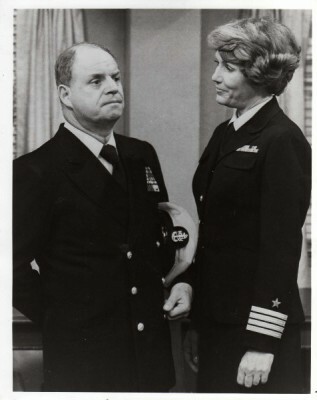 U.S. Navy Chief Petty Officer Otto Sharkey (Rickles) considers leaving the service because he finds the younger generation soft, plus he's aghast to learn that his new Commanding Officer is, ye gads, a woman: Captain Quinlan (statuesque Elizabeth Allen, best remembered as the department store saleslady who menaces Anne Francis in the classic Twilight Zone episode "The After Hours"). By the end of the pilot episode, however, it's clear Sharkey's here to stay, shackled to dumb recruits that make easy targets for Rickles's signature - if greatly dialed back - politically-incorrect ethnic and racial humor: Rodriguez (Richard Beauchamp), a Puerto Rican; Kowalski (Tom Ruben), a Polish-American; Skolnick (David Landsberg), a Jew, etc. Further, in a clever bit of casting, Sharkey's assistant, seaman Lester Pruitt (Peter Isacksen), is a Southern hick who at 6'7" tall positively towers over the 5'6" Sharkey. Sharkey's best friend is the more agreeable, less excitable CPO Dave Robinson (Harrison Page), an African-American. Rickles, of course, had for years been America's preeminent "insult comedian," especially in Las Vegas, where his "Merchant of Venom" act attracted the attention and support of Frank Sinatra ("Make yourself at home, Frank. Hit somebody! "), Rickles eventually joining the fringes of the Rat Pack. Rickles began turning up in movies and on television, making his film debut in Run Silent, Run Deep. He was a semi-regular in AIP's Beach Party movies, and gave a surprisingly good straight performance in Roger Corman's X (better-known, if incorrectly, as The Man with the X-Ray Eyes, 1963), in which Rickles was impressively repulsive. Probably Rickles's best-remembered film role was as the Bilko-like con man Sgt. Crapgame in the anachronistic World War II comedy Kelly's Heroes (1970). Watching CPO Sharkey, one gets the distinct impression all would have preferred to see Sharkey fashioned more after that character, but clearly it would have made the series' many similarities to Sgt. Bilko (a platoon of dumb misfits, a fast-talking sergeant/CPO at odds with an oblivious CO, etc.) even more obvious, bordering on flat-out plagiarism. Instead, CPO Sharkey is rather homogenized, neither the great grifter that was Phil Silvers, nor is he really "Don Rickles," the amazingly durable, often hilarious live talent that continues to perform at age 89. The scripts are all pretty generic: Sharkey tries to get rid of a garrulous wino (Larry Storch) who has made the company his new hangout, the men try to hide an inflatable female doll, Sharkey tries to get his men out of a Tijuana jail, etc. It's interesting to consider that while a television network today probably wouldn't even allow Rickles's mild insults in these overly-P.C. days, if he were the same age now as he was back in 1976, Rickles could probably land a CPO Sharkey-type series on HBO or Showtime where he could really cut loose and incorporate much more of his great standup act. Regardless, both Rickles and the show's script are still reasonably funny, even if they never once approach the sublime hilarity of even an average Sgt. Bilko. Shooting CPO Sharkey on tape before a live audience helps. It feeds into Rickles's energies as a performer and the show takes on the properties of a live sketch that help versus a one-camera 35mm show sweetened with an artificial laugh track. CPO Sharkey was a mid-season replacement, premiering in December 1976. Thus, only 15 episodes were produced during its first season. The shows look okay given the limitations of color videography in the mid-‘70s. The mono audio is fine. The lone supplement is a good one. During CPO Sharkey's first season, Rickles appeared as a guest on The Tonight Show one evening when longtime friend Bob Newhart hosted. During Rickles's segment he accidentally broke Carson's wooden cigarette case. The next night Carson, expressing (mostly) mock-outrage, stormed onto the CPO Sharkey set across the hall (both shows were filmed at NBC's Burbank Studios), interrupting a taping. At the time it seemed like the whole thing was thought up on the spot, but seen today it's obvious the segment was carefully staged well in advance, with only Rickles unaware of Carson's imminent arrival. Still, it's quite funny as Rickles contritely ad-libs with Carson, who in uncharted waters appears uncertain whether the bit is coming off, and rushes back to more familiar digs a bit prematurely. Not a great show but a pretty good vehicle for its star and reasonably, reliably entertaining, CPO Sharkey: The Complete Season 1 is Recommended.